From the Gedeo Zone of Yirgacheffe, Ethiopia, this natural processed coffee was one of our favorites last year, and we are excited to have it back for 2016. 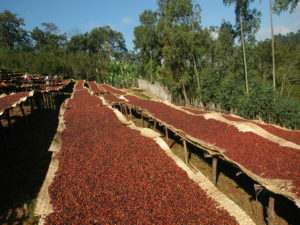 For the first 48 hours of drying, this coffee is turned constantly on raised beds to ensure even evaporation of moisture from the cherry. This ensures proper drying, prevention of mold, and a development of a lingering sweetness in the cup. You’ll find clean floral notes accompanying the hints of strawberry jam and milk chocolate in this coffee. Our friends and coffee partners at Ferris Coffee have created this drink and have passed on the recipe to us so we could share it with you! 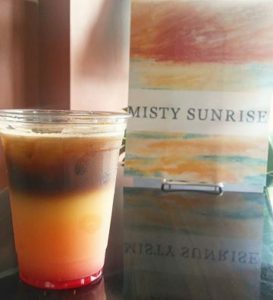 The Misty Sunrise is the perfect combination of Misty Valley espresso, orange juice, and a splash of grenadine to make a refreshing yet caffeinated beverage.